Embark from Puerto Montt or Quellón to Chaitén via ferry to observe Corcovado National Park (*), explore in depth the forests of Pumalín Douglas Tompkins National Park and continue south along the Carretera Austral, visiting Queulat National Park. Meet part of the Biosphere Reserve of the Temperate Rainforests of the Southern Andes and discover the Alerce Andino National Park, the Hornopirén National Park and the Pumalin Douglas-Tompkins National Park, which protect thousand-year-old larches. Navigate the channels of northern Patagonia to view Corcovado National Park and Melimoyu. At Puerto Cisnes you can cross the Puyuhuapi channel to explore Magdalena Island National Park and Queulat National Park. (*)Corcovado, Melimoyu, and Isla Magdalena National Parks do not currently have public access infrastructure. 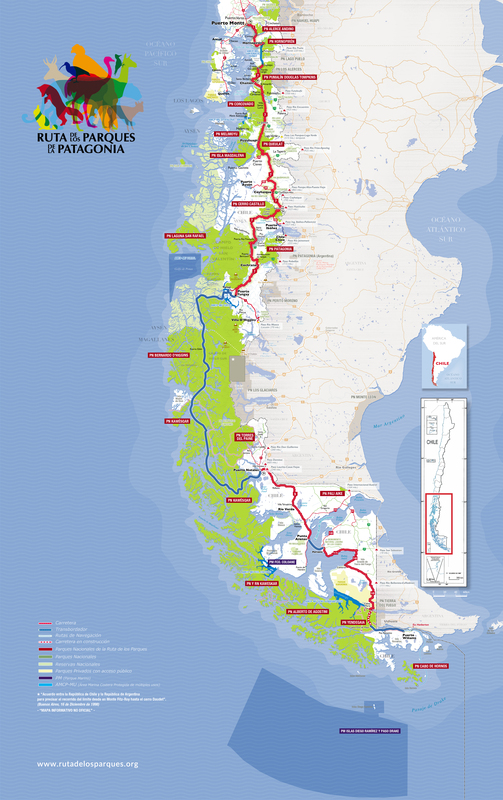 Start exploring the end of the world routes from Punta Arenas to Puerto Natales, then enter the Patagonian channels to the remote Canal de Las Montañas. Later continue to Torres del Paine and immerse yourself in the amazing landscapes of the Eighth Wonder of the World. Explore the immensities of Tierra del Fuego, the largest island in South America, making a stop earlier in Pali Aike, where the oldest archaeological remains of the region are recorded. Cross the Strait of Magellan from Punta Delgada to Cerro Sombrero, then head south to Lake "Kami". Discover the Pali Aike National Park, with an incredible lunar aspect due to its volcanic cones and lava scoria. Then take Route 9 to Puerto Natales and embark on a boat to the Bernardo O'Higgins National Park, visiting the Balmaceda and Serrano glaciers, and then explore the wonders of the Paine massif.